This was a treat. I loved it — and it was an experiment! I will be refining this for sure, but it's worthy of a post. I made this recipe low-carb by using spaghetti squash where I would have used regular spaghetti. The squash worked with the onion and red pepper to form a nice vegetable base and the turkey gave it extra heft in the belly. The star here is the cheese though, specifically - the cream cheese. It's a decadent and rich addition that really binds all the flavors together. Next time I will mix in the cream cheese a little more thoroughly — I used dollops of it in this recipe! 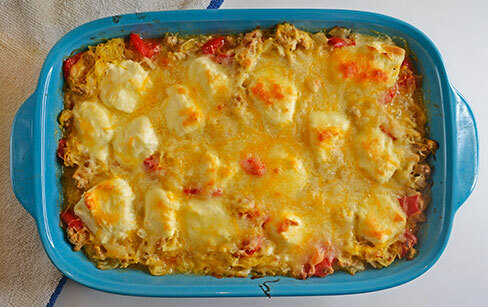 If you like spaghetti squash you have to try this, or a variation of it. Cut spaghetti squash in half length-wise and scoop out seeds. Drizzle with olive oil, season with salt and pepper to taste. Place on a baking sheet and bake in a pre-heated 400° oven for 35 to 40 minutes. Remove and let cool. In a large skillet over medium heat cook onion and red pepper in a little olive oil until soft, 3 to 4 minutes. Salt and pepper to taste. Add ground turkey, breaking up and stirring occasionally until cooked through. 4 to 5 minutes more. Remove from heat and let cool. Scrape spaghetti squash out of shell with a fork and into Turkey mixture, stirring to combine. Stir in 3/4 of the shredded cheese. Scoop mixture into baking dish. Top with dollups of cream cheese and remaining shredded cheese. Bake in a 350° oven for 30 minutes, or until cheese is bubbly. remove from oven and let rest 15 minutes before serving. The only thing in this dish not leftover or standing on the edge of spoiled are the eggs and chipotle ranch sauce made a couple days ago. I think the Gods of fresh food smiled on my effort to not waste anything because I really enjoyed this. The onion and red pepper are really the star here with a moderate amount of chicken to add a little heft. 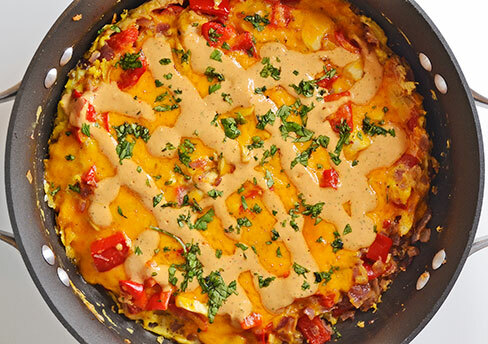 Bound with eggs and topped with gooey cheddar cheese, this was a winner winner low-card dinner. In a medium-sized pan over medium heat, saute the onion and peppers in a little olive oil until soft, 4 to 6 minutes. Salt and pepper to taste. Half way through toss in the chicken. In a bowl, beat eggs until white and yolk are incorporated together. Once peppers and onion are cooked through, pour eggs into pan, shaking and jiggling to allow egg to get into space between onion, pepper and chicken. Let cook on stove top for 3 to 4 minutes or until egg at bottom is set. Top with cheese and place under broiler. Broil until cheese is melted and bubbly and egg on top is set and entire frittata is cooked through, 2 to 4 minutes. Remove from under broiler. Garnish with chipotle ranch sauce and cilantro before serving. I'm not the biggest seafood fan in the world. In general, I like it best when the "fish" flavor is mild and it's breaded and fried. Shrimp is a different story. As long as it's ultra fresh, I like it prepared almost any way. For these tacos, I sauted the shrimp in olive oil with a little salt and pepper. That's it. The key was cooking them so they were firm but tender and burst in your mouth when bit into - that is the perfect texture for tacos! The real flavor and seasoning for this dish is the chipolte ranch sauce that I made from scratch. I was heavy with the chipotle for it because I wanted it extra smoky with some good kick. The creamy base can really tame the kick, so more chipotle in adobo is required for extra zing. I used corn tortillas which is not low carb, but I'm not really on a low-carb diet — I'm just paying attention to my carb intake and trying to keep it as low as possible without being miserable. I'm not ready to throw away my corn tortillas. I'll limit my french-fry intake, but corn tortillas are off limits for now! Honestly - I destroyed these tacos. The bursting shrimp with the chipotle ranch sauce was mouth-watering. The onion and cilantro garnish added a real freshness to the bite. All of this wrapped in a lightly-fried corn tortilla made for some of the best homemade tacos I've had in a long time. Try this if you are a shrimp taco fan. — With blade of a blender running, drop garlic clove in to mince. Add all other ingredients and blend 3 or 4 minutes. Stop blender and scrap down sides if needed during process. Pour into container and refrigerate 1 hour berfore serving. — In a little olive oil over medium high heat saute shrimp 1 min. to 1 min, 30 sec. per side or until just cooked through and translucent. Salt and pepper to taste. 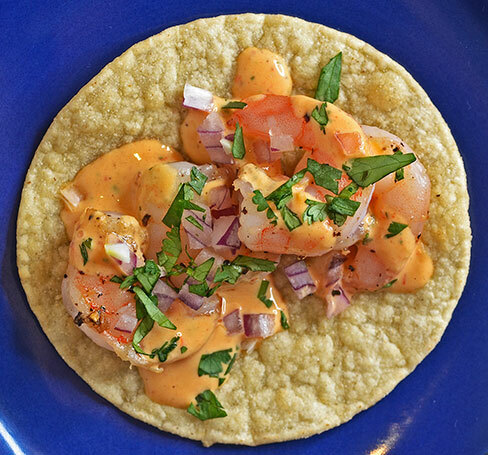 — Assemble tacos - layer shrimp, sauce, onion and cilantro — then devour! Note: The corn tortillas here are 19g of carbs for a serving of three. Ok. Its not actual fries - but one can dream. It's asparagus spears — and they were still pretty tasty. 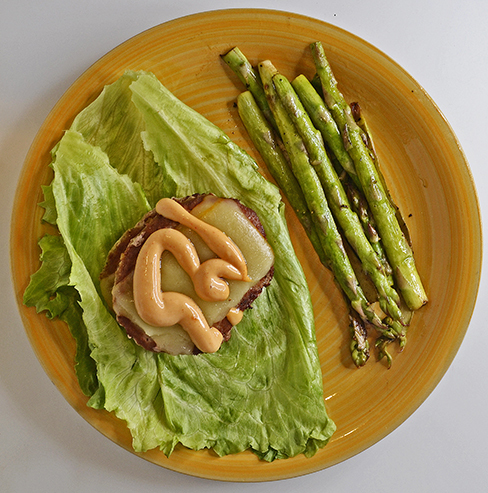 Using lettuce to wrap the double-cheese turkey burger — that's the real low carb thing about this meal. I really like throwing away the bread. The burger is what it's all about for me, so this gets rid of the gluten-loaded pillow that keeps your hands from getting messy and replaces it with a paper thin crunchy leaf. Not a bad trade-off in my book. The burgers were cooked over medium high heat in a little olive oil with salt and pepper to taste, about 5 minutes per side. The asparagus followed in the same pan for 3 to 4 minutes, tossed a couple of times and seasoned with salt and pepper — burgers rested while asparagus cooked. I ate 2 of the burgers wrapped in big lettuce leaves with chipotle mayo as garnish and all of the asparagus for the meal. I have to admit — it was tasty. A nicely seasoned turkey patty with creamy cheese and smoky chipotle mayo really hit the spot. Although I would love to have had real french fries, the al dente asparagus tossed with Worcestershire had a crunchy, salty and slightly sweet taste that I really liked — but I have always liked asparagus when it's fresh from the produce isle and perfectly cooked. I'm doing this again for sure. The experiments continue! I'm not on a strict no-carb diet, I'm just watching them as part of an effort to adjust my diet and life-style to live more healthy. This plate is a perfect example of how I have been preparing diners with less carbs in mind. 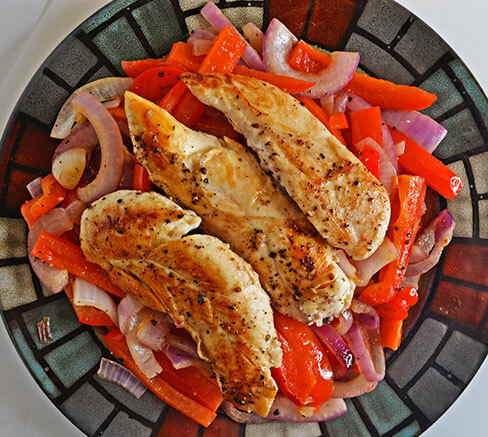 In the past, I would have served this — sauted onions, peppers and chicken — over a heaping mound of white rice. Afterword, I would have needed a nap and then a wheelchair to get around in until I had digested some of it. All cooked over medium heat in a little olive oil with salt and pepper to taste. (I ate half for the meal, and saved the other half for leftovers.) I also ate a whole avocado as an added bonus. I don't know the exact carb count but it's pretty low. I think around 20 grams. I'm still pretty new at the carb counting game but that is my best estimate. Low carb or not, sauteed onions and red peppers are a favorite of mine. The sweetness that comes out during a 6 to 10 minutes saute in a little olive oil with salt and pepper really hits the spot. They were the star here, the chicken was just filler, especially now that the ultimate filler — rice — had been left out. 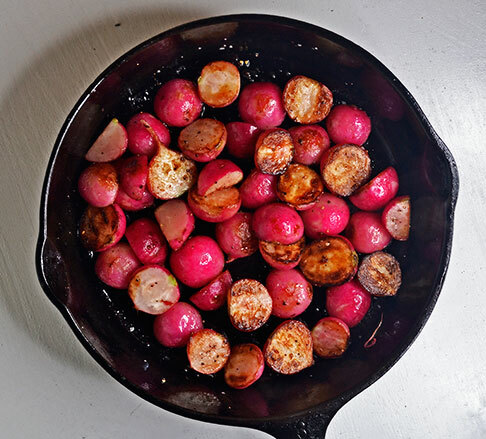 I have had roasted radishes many times and really enjoyed them. They are a close substitute for a roasted potato. This is the first time I tried to saute radishes. I did it simple — with olive oil, salt and pepper in a cast iron skillet over medium heat. 10 to 15 min., Tossing occasionally. They turned out ok. Edible, but nothing special. They were a little inconsistent as far as doneness. Some were softer than others, and there was a peculiar taste to them - almost earthy in a way. Not sure if it was the radishes or the well-seasoned pan I cooked them in. It wasn't a bad taste, just something a little unexpected. This will need some work before I sing the praises of a radish-potato substitute recipe, but it was fun to try something new. I wanted to post this because it's my first attempt at intentionally creating a low-carb side dish. As a way of trying to eat more healthy, I have cut back on the bread, potato, rice and pasta. (And sugary stuff in general). Not fully eliminating them, but have become conscience of carbs and want to limit my intake. A 2 oz. serving of red potatoes has 10 grams of carbs. The same amount of radishes contains 1 gram. That's 10 times less on the Carb-o-belly scale!